Hot Springs Hotel and Brewery was a Utah Pony Express station, inn and brewery founded in 1856 by Porter Rockwell at Point of the Mountain, modern-day Bluffdale, Utah. It was a contract Pony Express station, ten miles south of Trader's Rest station. Rockwell is known historically as the bodyguard of early Mormon leader and Utah settler Brigham Young. The brewery was Utah's first[a] and at its peak made 500 gallons of beer a day. In October 1934, a memorial marker was placed in Bluffdale, incorporating stones from the inn's stable. It was moved at a later date to the present location (40°29′10″N 111°54′00″W﻿ / ﻿40.486°N 111.900°W﻿ / 40.486; -111.900) on Pony Express Road. ^ Listed as the state's first by Salt Lake Tribune and by Beehive Archive. 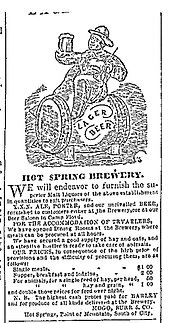 Other sources list Utah's first commercial brewery as Henry Wagener's California Brewery, established in 1864. ^ National Park Service 1979. ^ Salt Lake Tribune 2012. ^ Salt Lake City Weekly 2011. ^ a b City of Bluffdale 2017. This page was last edited on 19 November 2017, at 21:35 (UTC).